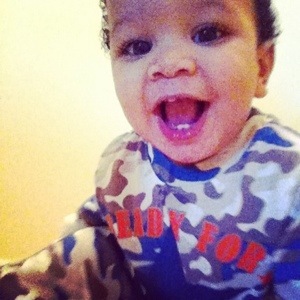 First off for those of you who don’t know I have a one year old son named Caden. He has very curly hair and beautiful hazel eyes that all the girls drool over. His smile is the sweetest and his personality is even sweeter. With that said I never realized how much of a flirt my son is until recently. He has always watched the pretty girls and do his little thing around them but recently he has done more. The first time was about a week ago. My mom had takin us out for lunch at Apple Bees for my birthday. The waitress was really sweet and she was cute. As she walked away Caden leaned back in his high chair and watched her walk away to get his juice and then started blowing kisses to her and having this little cute bad boy smurk on his face I was so shocked. The second time was today at my teen 4 teen group that we attend with other teen moms and there kids. There is this little girl that is maybe 2 months younger then Caden and he was kissing her the whole time we were there it was cute but my god he is a flirt!